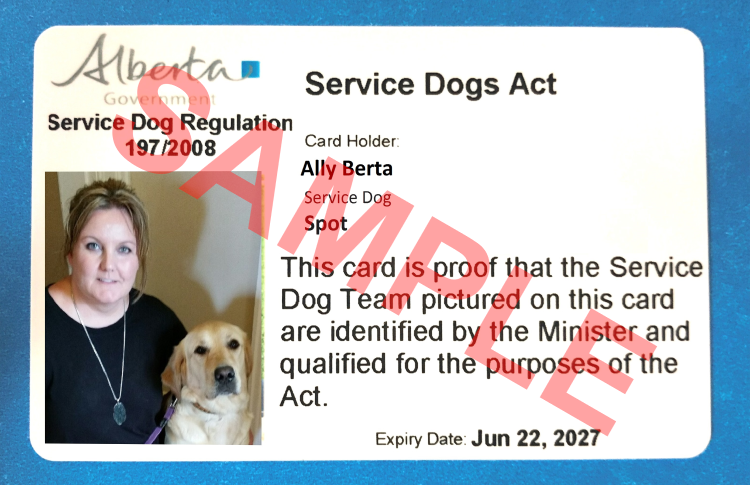 Qualified service dog teams must have an Alberta Service Dog Identification Card to ensure access to public places. Service dog owners should carry their ID with them at all times when in public. A Service Dog Identification Card verifies that an individual and their service dog have protected public access rights in Alberta. If your service dog does not have one of these qualifications, you can apply to have your service dog assessed. There is no cost for a service dog identification card. You will be required to submit a photo of you with your service dog. Your assessor or trainer may be able to take your photo and submit it on your behalf. The face of the user must be clear and visible. An official Identification Card will be mailed to you in approximately two weeks.